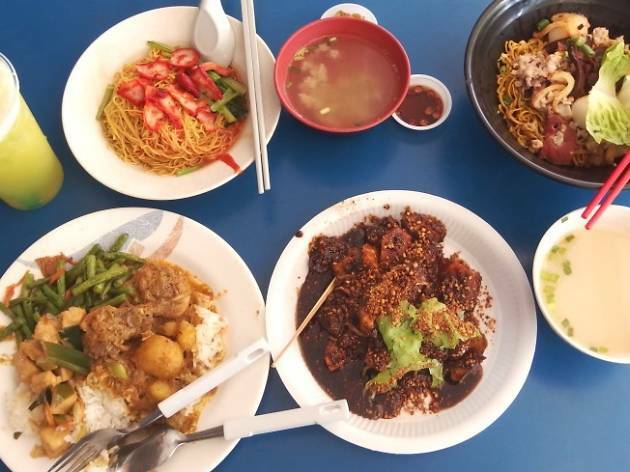 There’s no lack of food options in Kovan, but most are only open at night – except this food centre. Just be sure to arrive before 1pm to get the best of the food options out here. The mee kia (thin yellow noodles) at Fa Ji look hand-cut and taste a little more floury than a usual bowl, but what we really like are the sinful fried pork lard bits. 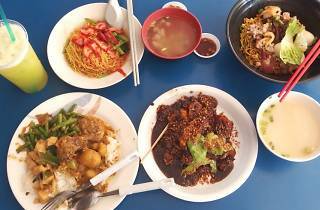 The punchy, peanut-ty sauce is hard to beat, but you’ll need to add cuttlefish ($2), jellyfish ($2) and century eggs ($1) to fill up. It doesn’t hurt that we only paid $3.60 for big scoops of a meat and two vegetables dishes – oh, and give the curry chicken a try. Although the sweet, tangy sauce is the stall’s selling point, the true highlight here is the cloudy broth with flavourful wantons.